Victrol 4003 is the trademark for Dnr Industrial lubricants line of high performance water miscible metal removal fluids. Formulated with leading edge base oils, additives, and emulsifiers, with non-chlorinated products provides dependable performance in a wide array of metal removal processes. The product is designed to work in a variety of hard and soft water qualities and offer low foam potential and long-term corrosion protection for machine and components. Low maintenance and inherently stable, Victrol 4003 is designed for the modern machine shop where long service life, excellent machining performance and health and environmental concerns are important factors for increased productivity. Victrol 4003 is supplied in concentrated form and require mixing with water at the point of use. FOR REUSABLE EDM WIRE CUT MACHINES 40 LTRS to 60 LTRS OF DE-MINERALISED WATER with 1 LTRS OF DNR VICTROL 4003. Trial Pack Available of 1 LTRS from our andheri office address. 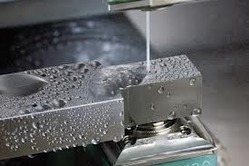 Looking for Edm Wire Cut coolant ?